This sweet little nursery rhyme actually has a more sinister overtone. Often you find that when you dig a little deeper into the origins and meanings of nursery rhymes, they are not the innocent, dainty tales we enjoy humming and reciting. 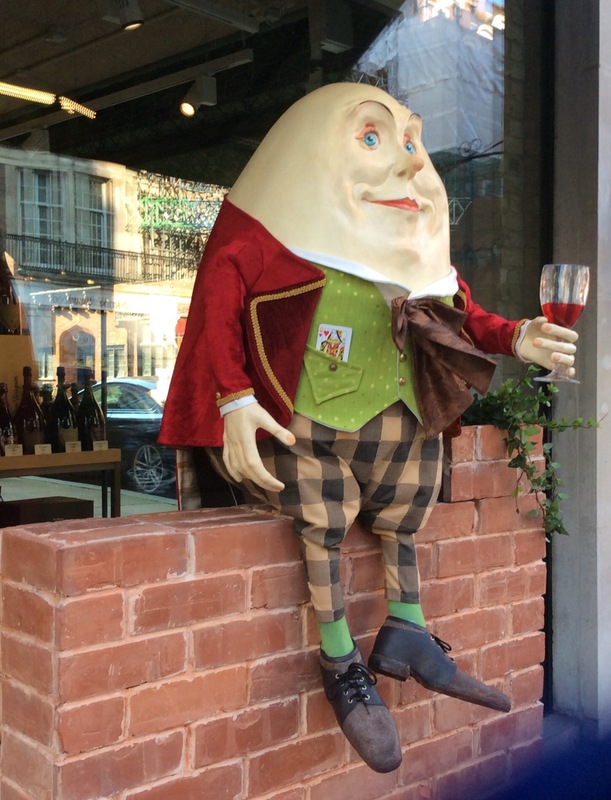 Let’s look (photo below) at this Humpty – one too many glasses of wine will tip him over the edge of the wall, on which he precariously balances; in turn his ‘Easter egg’ head will crack open and no matter what help can be provided, no one will be able to mend him. But let’s not be sour on a day like today, Easter Monday: the sweetest and stickiest day of the year. The days are getting longer, the gardens are getting brighter, and I am seeing a play tonight called ‘Reasons To Be Happy’ at London’s Hampstead Theatre … start counting your reasons.